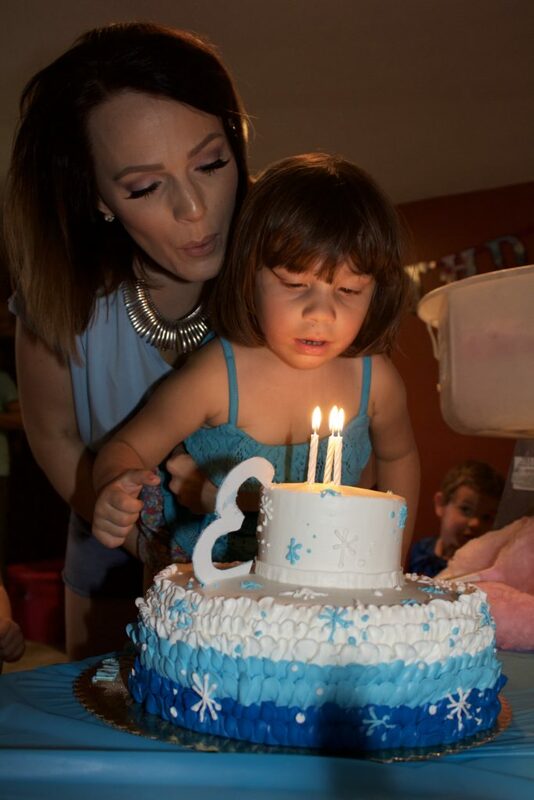 Last weekend, we celebrated our feet middle daughter’s 3rd birthday! She is such a joy in our lives and has such a little personality. I could go on forever as a beaming mommy, but on to the party details. All she wanted for her birthday was an “Elsa party”. 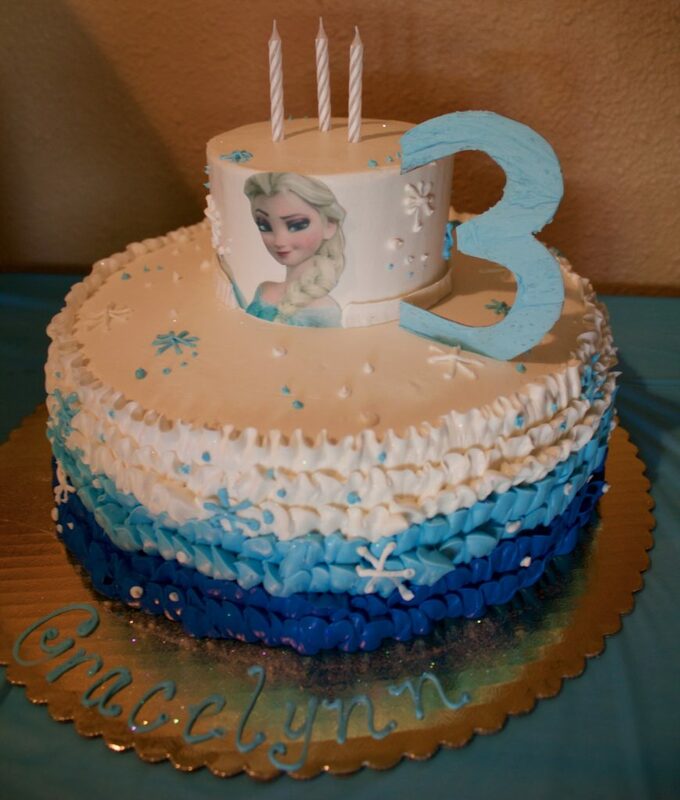 So, I figured out how to throw together a Disney Frozen birthday party for our 3-year-old. It’s hot here in Arizona still, so it’s difficult to theme the party with the weather. 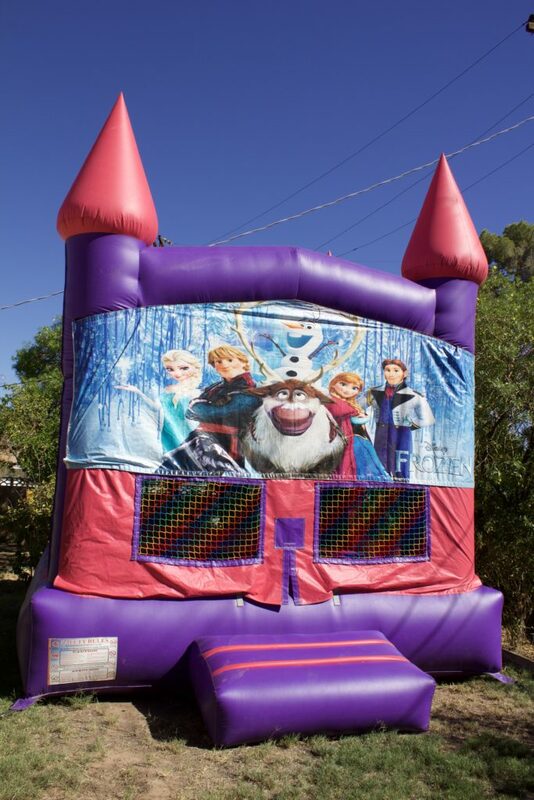 Thankfully, this means we could host a lot of our Disney Frozen birthday party outdoors. Food- When it comes to food, I always go all out with the theme. 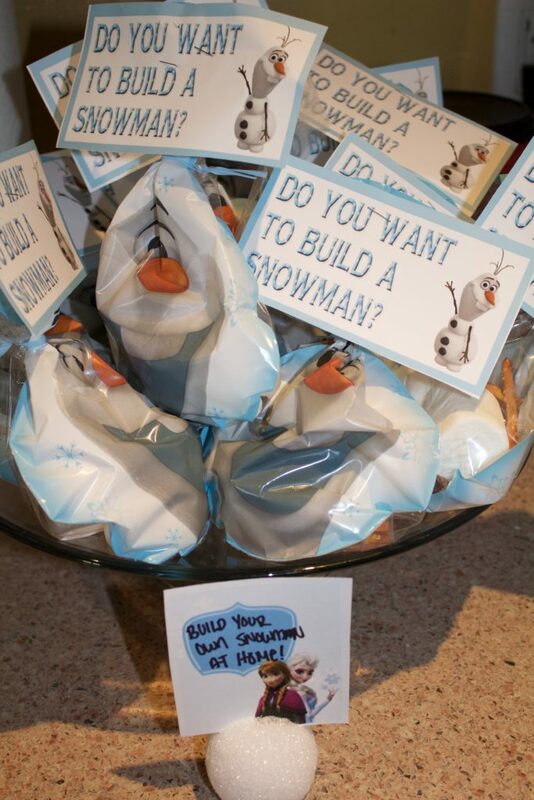 Aside from the decor, I feel like you can do the most with the theme when it comes to what you decide to serve, especially when it comes to a Disney Frozen birthday party. 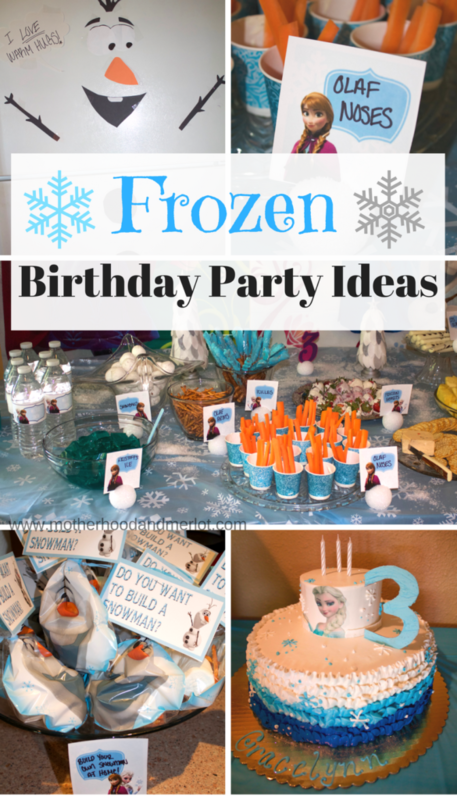 Decor- It was pretty easy to find Frozen Themed Birthday party decor, since every little girl loves it. I got some window clings in the shape of snowflakes, Clear Snowflake Plastic Tablecloth that I put on top of a blue tablecloth, some light blue dinnerware (or get the complete Disney Frozen Party Supplies set here)., and of course this 40inch Olaf balloon. I got the idea for these adorable “snowball” placeholders here. I just used some printables like these, printed them out, made a slit in the top of each Styrofoam Ball 1.5-Inch , and placed them in there. I also cut off the bottom of the styrofoam balls so that they sat stationary on the table. 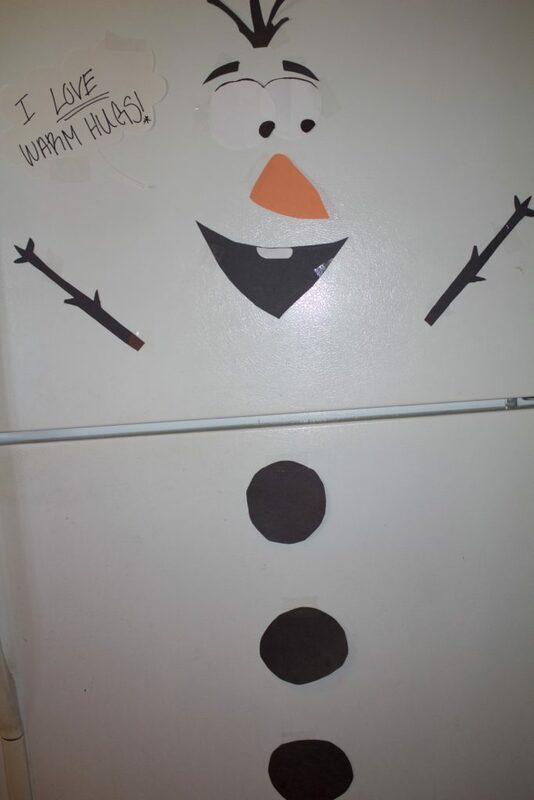 I put together this fridge Olaf using some construction paper and sharpies. It was kind of “figure it out until it looks good” project, but I think it turned out really cute! Just followed a picture of Olaf, and cut out the different shapes until I liked the way that they looked. 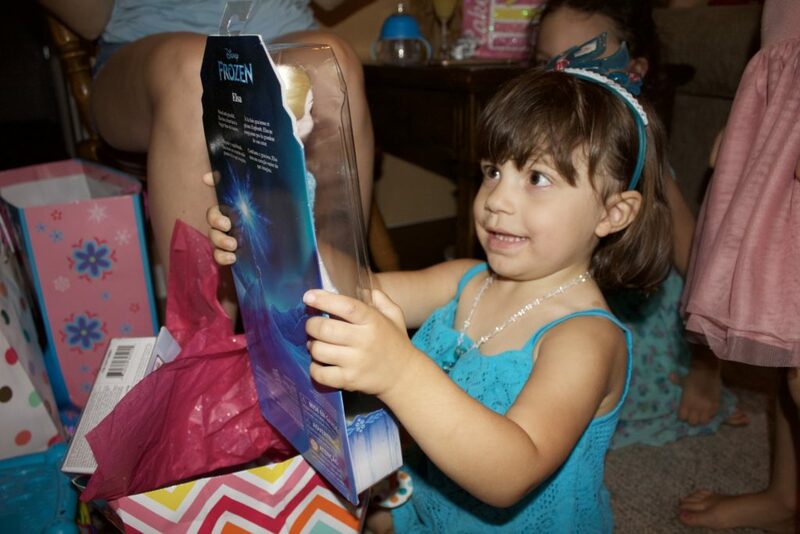 Our little birthday girl had so much fun at her Disney Frozen birthday party, and she was definitely out early that night… after opening all of her Frozen theme birthday presents of course. Want more party ideas? Check out this Mickey Mouse birthday or this Circus Themed birthday we had for our twins. Holy FROZEN party!! My daughter would’ve loved to go to this party! You went alllllll out in every aspect! This is sure to be a birthday she never forgets! Great job! You did such a great job!!! What a fun party! So adorable! What a fun party idea. I love all of the treat names! My favorite is the “Do you want to build a Snowman kit”! You are SO creative!! We love Anna and Elsa over here…my girls would be so excited!! This is so adorable. 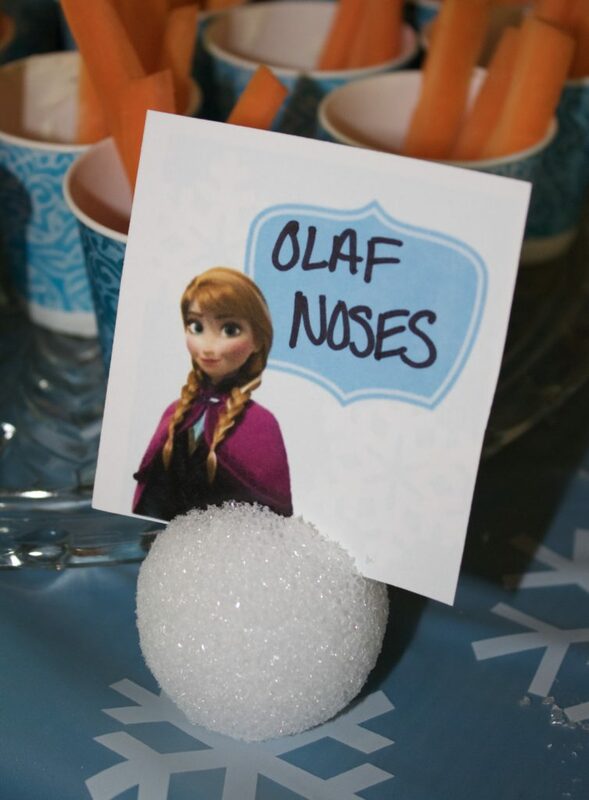 I think the Olaf noses are my favorite. So many cute ideas!! I love the cake and the Olaf on the fridge! Adorable! This is so cute! 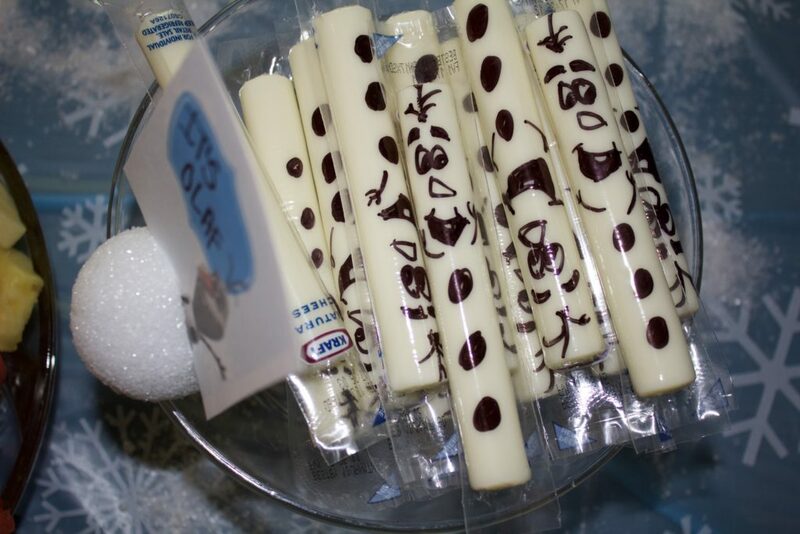 I love the Olaf arms and what you did with the cheese sticks. You did a great job! My 3 year old would love this! Wow, the party turned out absolutely adorable! I love the amount of thought you put into EVERY little detail. The Build Your Own Snowman was such a great idea! Love it! 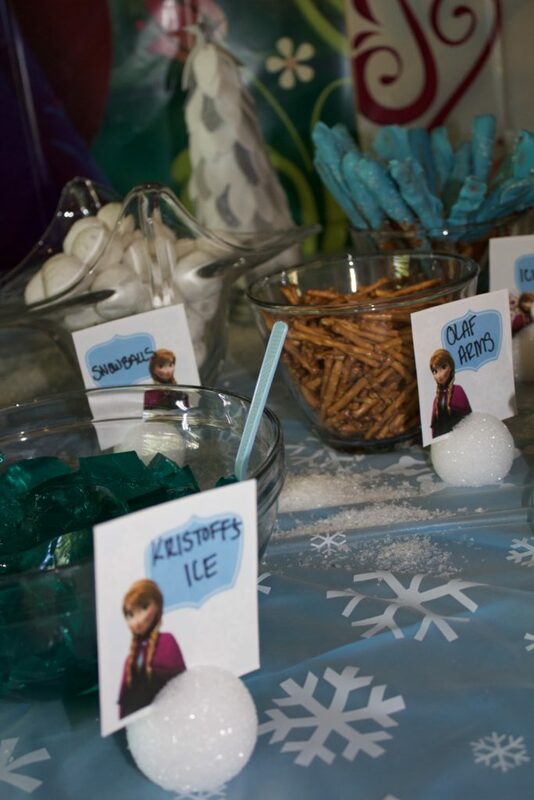 We did a Frozen party this year too. It’s definitely a fun theme! Such a cute party! And that cake is gorgeous! I agree, it’s always fun to try to serve food that follows the theme. I think kids especially get a kick out of that. 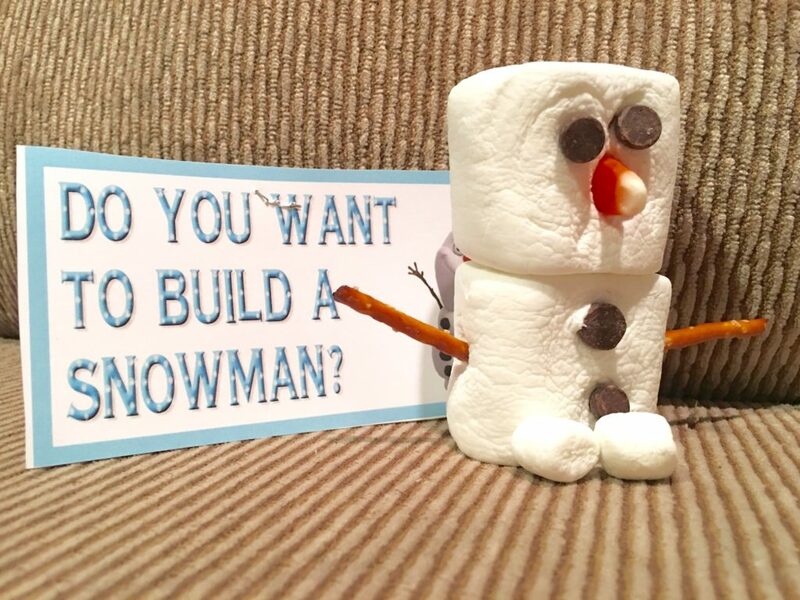 Love your little snowman building kits, so cute! GREAT job! 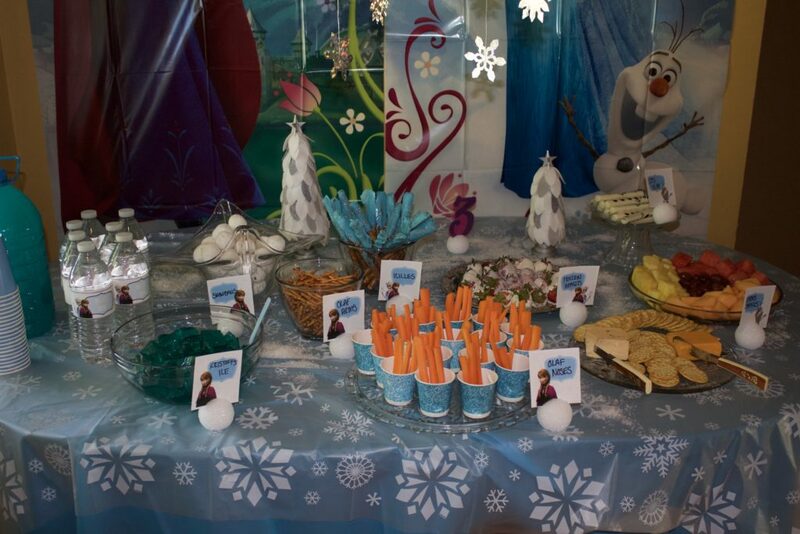 we loved our Frozen party too – I love the cheese sticks, great idea! This is seriously SO CUTE!!! Love!